There is a period of time required in implementing a new discretionary trading strategy, in which the trader must make the strategy their own. This goes far beyond just learning the rules of the strategy. A trader must take the time to understand the principles underlying the strategy, to confirm these principles are compatible with their current market beliefs, and to blend the new information with their existing belief systems. You should NOT jump straight into live markets. Success in operating a discretionary trading strategy is a result of identifying and maintaining an accurate market bias, identifying wholesale trade opportunity within that environment, and managing trades to balance competing requirements of minimising risk and maximising gains. Significant changes to your approach (such as when adopting a new strategy) will affect both your assessment of bias and the way you identify and manage trade opportunity. You should take these changes through a graduated test and evaluation process in order to gain trust in the strategy, and trust in your ability to trade the strategy, before risking funds in a live environment. Develop belief in the strategy through a review of 20+ sessions with the benefit of hindsight. Come to an understanding of how the strategy identifies changes in market environment and identifies and manages trade opportunity. 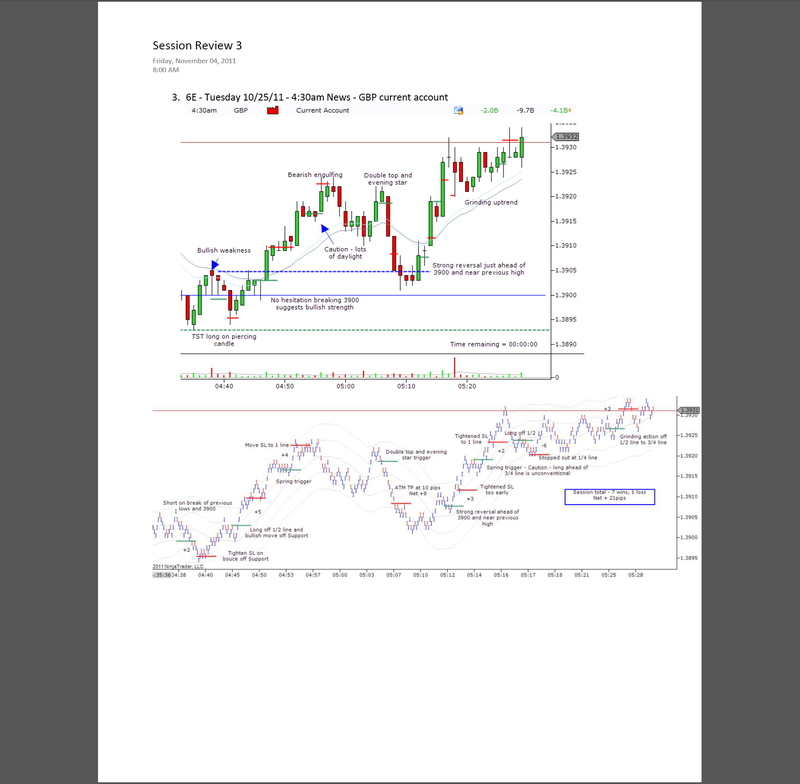 Print out charts and fill them with hand-written notes of hindsight based analysis. This is great for future review AND for motivation. Trading exactly as if you were trading live, this is your opportunity to learn to operate the strategy on the RHS edge of the charts. Record results. Review the session as above, with the benefit of hindsight, comparing actual performance against perfect performance. Find areas requiring improvement. The goal here is to learn to apply the edge in a safe environment, while ensuring minimal influence on results from negative psychological factors. This stage should continue as long as necessary to prove a consistent edge over time. Again (for short-timeframe daytraders) I recommend at least 20 sessions (minimum). Only when a consistent edge is proven in a simulated environment, should you progress to a live environment. Position sizes should be kept to an absolute minimum possible, with the trader remaining in this stage until the edge is confirmed still available with the added psychological challenges associated with live risk. Depending on experience, you may now increase size either straight to "normal" full-size or gradually via a planned step-by-step increase. The following charts were sent to me by Ian, a reader of the YTC Scalper, who kindly offered permission to share them via this article. Ian is currently undergoing his own process of making the YTC Scalper strategy his own. He's currently at the simulation stage and is progressing well. 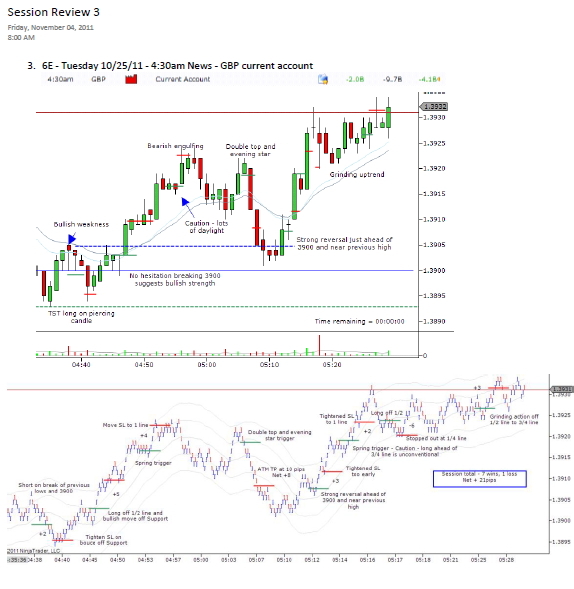 The charts are from his session review from October 25th, and show a nice sequence of scalp trades producing a total of +21 ticks (+2, +5, +4, +8, +3, +2, -6, +3) over a one hour period in the Euro. This is a great example of someone on the right path; taking the time and putting in the required effort to blend the YTC Scalper strategy with his existing knowledge, skills and attitude; testing, reviewing and improving in a safe environment before progressing to live markets. Like Ian, have you implemented a graduated learning process? Are you recording your thoughts on price action, market bias and trade opportunity during a session? Are you reviewing these post-session to identify consistent areas of strength and weakness and to appropriately plan for further development? Like Ian, are you maximising the chance of success through implementing learning methods appropriate to a performance related activity? Or are you just hoping, wishing and praying that everything turns out ok?